If you are tired of locking your PC every time when you move away from your PC. 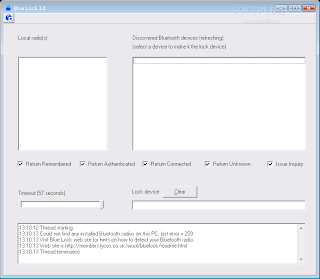 Don’t worry now you can lock your PC Automatically By using your Mobiles Bluetooth wonder how? Just download and instal “Blue Lock PC” software to your PC and it will lock your PC Automatically every time when you will go away from your PC. ‘Blue Lock’ use your Bluetooth mobile phone as a lock key, and when you go out of the range of the signal (typically 10 m distance) then it automatically lock your PC. When you return back in the range of the signal it Automatically unlocks your PC. this is very easy and simple even you don’t have to enter any password lock or unlock your system just go where you want to go and ‘Blue Lock’ will Automatically lock your PC. Blue Lock PC is Bluetooth-based software for specially made for notebooks you can also use this software on your Desktop PC if you have the Bluetooth device installed in your Desktop. Using your Bluetooth mobile phone as a key, Blue Lock PC automatically locks your PC when you leave the range of the signal. To use this service just download this software download link is given below and install it to your PC. Now when you run the app it will Automatically detect all Bluetooth devices near your computer. Now select the mobile phone which you want to use from the given list and it will add the information in the “Lock Device” field. you can also select the time for your device detection and it will detect your device time to time and if it doesn’t detect your device then it will lock your PC again until it detects your device again. * You will not notice that the program working. * Blue Lock you don’t have to remember any kind of password and you will never forget Your password because you do not need them to use. * Just install Blue Lock and make your PC secure Automatically. *In the lock mode, it fully disables access to the task manager of the Windows operating system, and any unauthorized keyboard access to your system will fail. * Any shortcuts key like ALT F4, CTRL ALT DEL or ALT-TAB will not work in lock mode. * It’s Bulletproof startup lock (couldn’t be bypassed in safe mode).